BION of Phlossa near Smyrna was a Greek bucolic poet who flourished in Sicily in the late C2nd and early C1st B.C. Only one complete poem, The Lament for Adonis, and a few small fragments of his other poems survive. The Greek Bucolic Poets. Translated by Edmonds, J M. Loeb Classical Library Volume 28. Cambridge, MA, Harvard University Press; London, William Heinemann Ltd. 1912. This Loeb volume is still in print and available new from Amazon.com (click on image right for details). 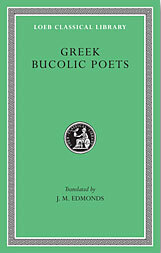 In addition to Bion, the book contains the Idylls of Theocritus, poems of Moschus, a pair of anonymous works (Megara and Dead Adonis), various pattern-poems (by Simas, Theocritus, Dosiadas, and Vestinus), as well as source Greek texts, Edmond's introduction and footnotes and an index of proper names. Like all the so-called songs in this book, this poem is lyric only in spirit. It is not one of the actual songs sung at the Adonis festival, but, like the son in Theocritus XV, a conventional book-representation of them written for recitation. The suggestion here and there of refrain is intended primarily to aid the illusion, but also serves the purpose sometimes of paragraphing the poem. The poem belongs to the second part of the festival; it is the dirge proper. As in XV the wedding-song refers to the coming dirge, so here the dirge refers to the past wedding-song. The Lament for Adonis is generally believed to be the work of Bion. I cry woe for Adonis and say The beauteous Adonis is dead; and the Loves cry me woe again and say The beauteous Adonis is dead. Sleep no more, Cypris, beneath thy purple coverlet, but awake to thy misery; put on the sable robe and fall to beating thy breast, and tell it to the world, The beauteous Adonis is dead. Woe I cry for Adonis and the Loves cry woe again. The beauteous Adonis lieth low in the hills, his thigh pierced with the tusk, the white with the white, and Cypris is sore vexed at the gentle passing of his breath; for the red blood drips down his snow-white flesh, and the eyes beneath his brow wax dim; the rose departs from his lip, and the kiss that Cypris shall never have so again, that kiss dies upon it and is gone. Cypris is fain enough now of the kiss of the dead; but Adonis, he knows not that she hath kissed him. Cruel, O cruel the wound in the thigh of him, but greater the wound in the heart of her. Loud did wail his familiar hounds, and loud now weep the Nymphs of the hill; and Aphrodite, she unbraids her tresses and goes wandering distraught, unkempt, unslippered in the wild wood, and for all the briers may tear and rend her and cull her hallowed blood, she flies through the long glades shrieking amain, crying upon her Assyrian lord, calling upon the lad of her love. Meantime the red blood floated in a pool about his navel, his breast took on the purple that came of his thighs, and the paps thereof that had been as the snow waxed now incarnadine. Lost is her lovely lord, and with him lost her hallowed beauty. When Adonis yet lived Cypris was beautiful to see to, but when Adonis died her loveliness died also. With all the hills ‘tis Woe for Cypris and with the vales ‘tis Woe for Adonis; the rivers weep the sorrows of Aphrodite, the wells of the mountains shed tears for Adonis; the flowerets flush red for grief, and Cythera’s isle over every foothill and every glen of it sings pitifully Woe for Cytherea, the beauteous Adonis is dead, and Echo ever cries her back again, The beauteous Adonis is dead. Who would not have wept his woe over the dire tale of Cypris’ love? She saw, she marked his irresistible wound, she saw his thigh fading in a welter of blood, she lift her hands and put up the voice of lamentation saying “Stay, Adonis mine, stay, hapless Adonis, till I come at thee for the last time, till I clip thee about and mingle lip with lip. Awake Adonis, awake for a little while, and give me one latest kiss; kiss me all so long as ever the kiss be alive, till thou give up thy breath into my mouth and thy spirit pass into my heart, till I have drawn up all thy love; and that kiss of Adonis I will keep as it were he that gave it, now that thou fliest me, poor miserable, fliest me far and long, Adonis, and goest where is Acheron and the cruel sullen king, while I alas! live and am a God and may not go after thee. O Persephone, take thou my husband, take him if thou wilt; for thou art far stronger than I, and gettest to thy share all that is beautiful; but as for me, ‘tis all ill and for ever, ‘tis pain and grief without cloy, and I weep that my Adonis is dead and I fear me what thou wilt do. O dearest and sweetest and best, thou diest, and my dear love is sped like a dream; widowed no is Cytherea, the Loves are left idle in her bower, and the girdle of the Love-Lady is lost along with her beloved. O rash and overbold why didst go a-hunting? Wast thou so wooed1 to pit thee against a wild beast and thou so fair?” This was the wail of Cypris, and now the Loves cry her woe again, saying Woe for Cytherea, the beauteous Adonis is dead. The Paphian weeps and Adonis bleeds, drop for drop, and the blood and tears become flowers upon the ground. Of he blood comes the rose, and of the tears the windflower. I cry woe for Adonis, the beauteous Adonis is dead. Mourn thy husband no more in the woods, sweet Cypris; the lonely leaves make no good lying for such as he: rather let Adonis have thy couch as in life so in death; for being dead, Cytherea, he is yet lovely, lovely in death as he were asleep. Lay him down in the soft coverlets wherein he used to slumber, upon that couch of solid gold whereon he used to pass the nights in sacred sleep with thee; for the very couch longs for Adonis, Adonis all dishevelled. Fling garlands also and flowers upon him; now that he is dead let them die too, let every flower die. Pour out upon him unguents of Syria, perfumes of Syria; perish now all perfumes, for he that was thy perfume is perished and gone. There he lies, the delicate Adonis, in purple wrappings, and the weeping Loves lift up their voices in lamentation; they have shorn their locks for Adonis’ sake. This flung upon him arrows, that a bow, this a feather, that a quiver. One hath done off Adonis’ shoe, others fetch water in a golden basin, another washes the thighs of him, and again another stands behind and fans him with his wings. The Wedding-God (Hymenaeus) hath put out every torch before the door, and scattered the bridal garland upon the ground; the burden of his song is no more “Ho for the Wedding;” there’s more of “Woe” and “Adonis” to it than ever there was of the wedding-cry. The Graces weep the son of Cinyras, saying one to another, The beauteous Adonis is dead, and when they cry woe ‘tis a shriller cry than ever the cry of thanksgiving. Nay, even the Fates weep and wail for Adonis, calling upon his name; and moreover they sing a spell upon him to bring him back again, but he payeth no heed to it; yet ‘tis not from lack of the will, but rather that the Maiden will not let him go. Give over thy wailing for to-day, Cytherea, and beat not now thy breast any more; thou needs wilt wail again and weep again, come another year. This fragmentary shepherd-mime is probably to be ascribed to an imitator of Bion. At Myrson’s request, Lycidas sings him the tale of Achilles at Scyros. Then prithee, Lycidas, wilt thou chant me some pretty lay of Sicily, some delightful sweetheart song of love such as the Cyclops sang to Galatea of the sea-beaches? I myself should like to make some music, Myrson; so what shall it be? The sweet and enviable love-tale of Scyros, Lycidas, the stolen kissed of the child of Peleus and the stolen espousal of the same, how a lad donned women’s weeds and played the knave with his outward seeming, and how in the women’s chamber the reckless Deïdameia found out Achilles among the daughters of Lycomedes. The neatherd stole fair Helen and bare her to Ida fell. No Greek but scorned at home to stand for all the woest of war. And woman-lightsome was his tread, all maiden to the sight. And praise the web she wove. The remaining poems and fragments are preserved in quotations made by Stobaeus, with the exception of the last, which is quoted by the grammarian Orion (Anth. 5, 4). Which will you have is sweetest, Myrson, spring, winter, autumn, or summer? which are you fainest should come? Summer, when all our labours are fulfilled, or sweet autumn when our hunger is least and lightest, or the winter when no man can work – for winter also hath delights for many with her warm firesides and leisure hours – or doth the pretty spring-time please you best? Say, where is the choice of your heart? To be sure, we have time and to spare for talking. ‘Tis unseemly for mortal men to judge of the works of Heaven, and all these four are sacred, and every one of them sweet. But since you ask me, Cleodamus, I will tell you which I hold to be sweeter than the rest. I will not have your summer, for then the sun burns me; I will not have your autumn, neither, for that time o’ year breeds disease; and as for your winter, he is intolerable; I cannot away with frost and snow. For my part, give me all the year round the dear delightful spring, when cold doth not chill nor sun burn. In the spring the world’s a-breeding, in the spring the world’s all sweet buds, and our days are as long as our nights and our nights as our days . . . I dreamed and lo! the great Cyprian stood before me. Her fair hand did lead, with head hanging, the little silly Love, and she said to me: “Pray you, sweet Shepherd, take and teach me this child to sing and play,” and so was gone. So I fell to teaching master Love, fool that I was, as one willing to learn; and taught him all my lore of country-music, to with how Pan did invent the cross-flute and Athena the flute, Hermes the lyre and sweet Apollo the harp. But nay, the child would give no heed to aught I might say; rather would he be singing love-songs of his own, and taught me of the doings of his mother and the desires of Gods and men. And as for all the lore I had been teaching master Love, I clean forgot it, but the love-songs master Love taught me, I learnt them every one. The Musses know no fear of the cruel Love; rather do their hearts befriend him greatly and their footsteps follow him close. And let one that hath not love in his soul sing a song, and they forthwith slink away and will not teach him; but if sweet music be made by him that hath, then fly they all unto him hot-foot. And if you ask me how I know that this is very truth, I tell you I may sing praise of any other, he be God or man, and my tongue will wag falteringly and refuse me her best; but if my music be of love and Lycidas, then my voice floweth from my lips rejoicing.
. . . I know not, and ‘tis unseemly to labour aught we wot not of. If my poor songs are good, I shall have fame out of such things as Fate hath bestowed upon me already – they will be enough; but if they are bad, what boots it me to go toiling on? If we men were given, be it of the Son of Cronus or of fickle Fate, two lives, the one for pleasuring and mirth and the other for toil, then perhaps might one do the toiling first and get the good things afterward. But seeing Heaven’s decree is, man shall live but once, and that for too brief a while to do all he would, then O how long shall we go thus miserably toiling and moiling, and how long shall we lavish our life upon getting and making, in the consuming desire for more wealth and yet more? Is it that we all forget that we are mortal and Fate hath allotted us so brief a span? . . . Happy are lovers when their love is requited. Theseus, for all he found Hades at the last implacable, was happy because Perithoüs went with him; and happy Orestes among the cruel Inhosptables,3 because Pylades had chosen to share his wanderings; happy also lived Achilles Aeacid while his dear comrade4 was alive, and died happy, seeing he so avenged his dreadful fate. Evening Star, which are the golden light of the lovely Child o’ the Foam,5 dear Evening Star, which art the holy jewel of the blue blue Night, even so much dimmer than the Moon as brighter than any other star that shines, hail, gentle friend, and while I go a-serenading my shepherd love shew me a light instead of the Moon, for that she being new but yesterday is too quickly set. I be no thief nor highwayman – ‘tis not for that I’m abroad at night – , but a lover; and lovers deserve all aid. Gentle Dame of Cyprus, be’st thou child of Zeus, or child of the sea, pray tell me why wast so unkind alike unto Gods and men – nay, I’ll say more, why so hateful unto thyself, as to bring forth so great and universal a mischief as this Love, so cruel, so heartless, so all unlike in ways and looks? and wherefore also these wings and archeries that we may not escape him when he oppresseth us?
. . . When he beheld thy agony Phoebus was dumb. He sought every remedy, he had recourse to cunning arts, he anointed all the wound, anointed it with ambrosia and with nectar; but all remedies are powerless to heal the wounds of Fate . . .
. . . But I will go my way to yonder hillside, singing low to sand and shore my supplication of the cruel Galatea; for I will not give over my sweet hopes till I come unto uttermost old age . . .
. . . It is not well, friend, to got to a craftsman upon all matters, nor to resort unto another man in every business, but rather to make you a pipe yourself; and ‘faith, ‘tis not so hard, neither . . .
. . . ‘Tis said a continual dripping will e’en wear a hollow in a stone . . .
. . . I pray you leave me not without some reward; for even Phoebus is paid for his music, and a meed maketh things better . . .
. . . The woman’s glory is her beauty, the man’s his strength . . .
. . . All things may be achieved if Heav’n will; all is possible, nay, all is very easy if the Blessed make it so . . .
2. “The wife that loved him well” : Oenonè, wife of Paris. 3. “Inhospitable” : the barbarous inhabitants of the shores of the Black Sea. 4. “his dear comrade” : Patroclus. 5. “Child o’ the Foam” : Aphrodite. 6. Better perhaps regarded as two fragments, the first ending “bring Love”; the following “and” is not in the Greek.